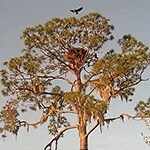 It’s just indescribable how great the Northeast Florida Eagle Nest season has been. Two tiny balls of fluff turning into mighty eagles with no apparent bumps in the road (but maybe a few bumps from a pesky owl) on their way to adulthood. 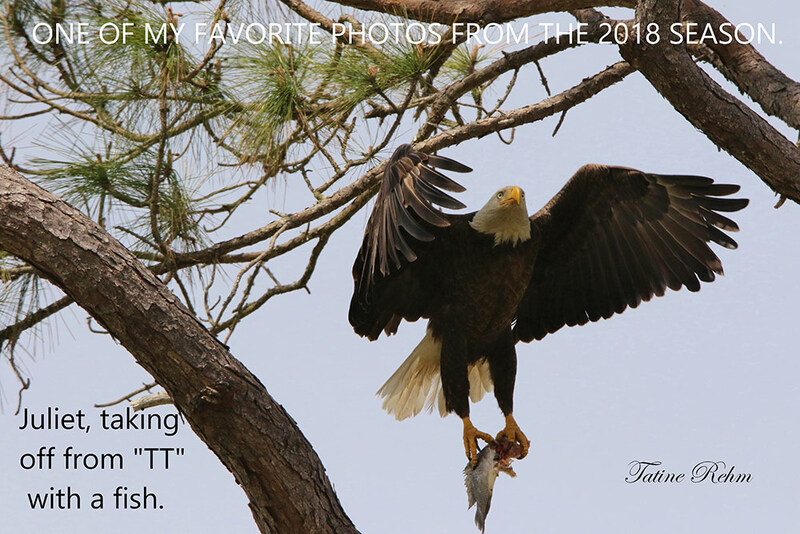 In this post, our Mods and RCOs (Remote Cam Operators) share favorite stories and memories from the 2017-2018 nesting season of Bald Eagles Romeo & Juliet. I can’t thank anyone without first thanking Al Cecere and the mighty American Eagle Foundation for making this exceptional cam experience happen. I wanted so badly to share Romeo and Juliet with the world. No finer organization could do what AEF has and is doing by sharing this window-into-the-wild globally. Hearing how these eagles have changed viewers lives is most humbling. The commitment and efforts of all behind the scenes at AEF, I applaud as well. 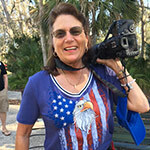 Next and very importantly…..the passion, faithfulness and commitment the AEF-NEFL cam staff (Moderators, Camera Operators, and ground crew alike) deserve great kudos. The Camera Operators deliver the best show possible 15 hrs/day 7 days/wk with on-going chat updates that are appreciated beyond measure. They don’t just move the cams but exam the eagles regularly, deal with cam issues in stride, report any anomalies and connect closely with each other and the Team. They deliver, and we cannot thank them enough for the commitment they exude. The extremely knowledgeable and faithful Moderators show their love and support for AEF and these special eagles in the chat room always. They are true educators. Their diligent response and patience in the chat room is above and beyond. I think it is apparent to all the love, kindness, and compassion this staff exudes is exponential. And to have a ground crew reporting instant activity on a regular basis off-site is truly a bonus and most appreciated. They do this out of passion as well…..willingly, as all the staff does. Last but certainly not least…..our show goes on simply because of these most special eagles, Romeo & Juliet and their offspring, who have stolen the hearts of many. The numbers viewing speak volumes. Romeo and Juliet teach us much about love, fierce protectiveness, commitment, and a simple routine like it’s just second nature to them. Oh, how they have blessed us all. I first found NEFL when I retired and was looking for a new nest cam to call home, since the one I had watched for years closed. I learned about this new cam in FL from a post on the Dollywood cam. I arrived there the day the cam went live and instantly fell in love with Romeo and Juliet. As a chatter, I felt welcome and I knew I had found my new eagle family. As a mod, I could not ask for a better group of people to work with. This season has been magical (pesky owl being the only bump in the road). Romeo and Juliet sure do make some pretty babies! 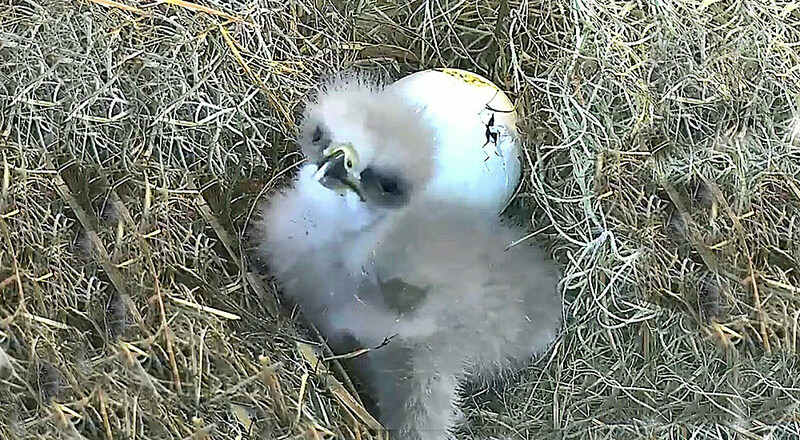 Sky and Spirit have been so much fun to watch from egg to fledge. They quickly got the hang of branching and their takeoffs and landings when they return have been spectacular. Soon they will be making their way into the world and we will shed some tears when they leave, but will be happy knowing they have had the best parents to send them on their way. As the wise Dr. Seuss said, “Don’t cry because it’s over. 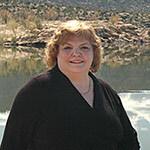 Smile because it happened.” Godspeed, Sky and Spirit. Picking only one memory from this glorious season is wayyyy hard to do! However, what gives me smiles are the personalities of these precious two. Hearing the squeees from both as dinner arrives, and watching the little temper tantrum from Sky if she didn’t get the fish, or watching Spirit sulk and look over the nest edge if he didn’t get it first! They make me smile every day seeing how they have become BFF, and they will live in a special place in my heart! Thank you Gretchen, Al Cecere, AEF and my fellow team mates for allowing me to join this wonderful family! God Bless Romeo, Juliet, Sky and Spirit and may God keep you safe from harm, and may you continue to soar to heights that we can only imagine. 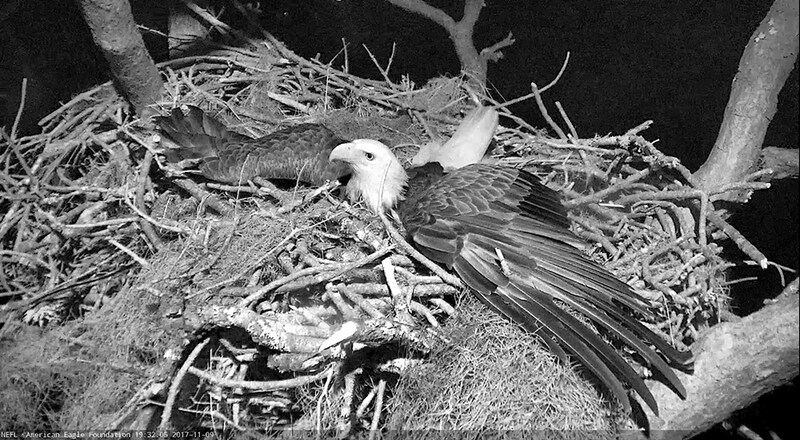 With the start of Bald Eagle nesting season in Florida, one never knows what to expect, and the Hamlet was no exception. With Romeo & Juliet returning late August/first part of Sept for the 2017 season (Juliet always has to take an extended vacation), I breathed a sigh of relief and could now sit back and watch them go about their daily activities. I chuckled and smiled as I watched Romeo & Juliet work so diligently on their nest, and with a few (maybe more than a few) disagreements on stick placements, it was all done for a reason – to build the best nest, with the most branches built up as high and interlocked as possible with their amazing beaks. This season, due to the recent hurricanes, the lumber yard was well stocked and Romeo & Juliet had their choice of so many nice branches. 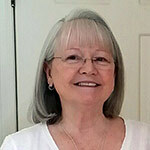 They built a fortress, then dug as deep as they could into the nest and lined it with their favorite bedding, Spanish moss which was was also in abundance in the Hamlet. 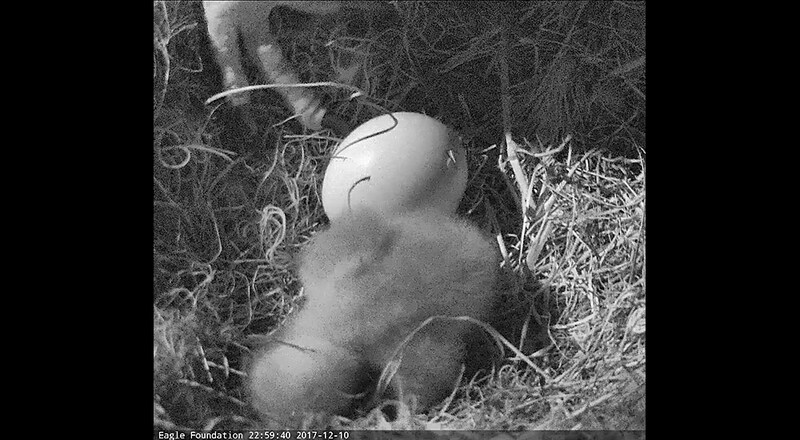 Nothing like a soft and comfy nest bowl to house impending eggs and future eaglets. Romeo & Juliet are the master builders! 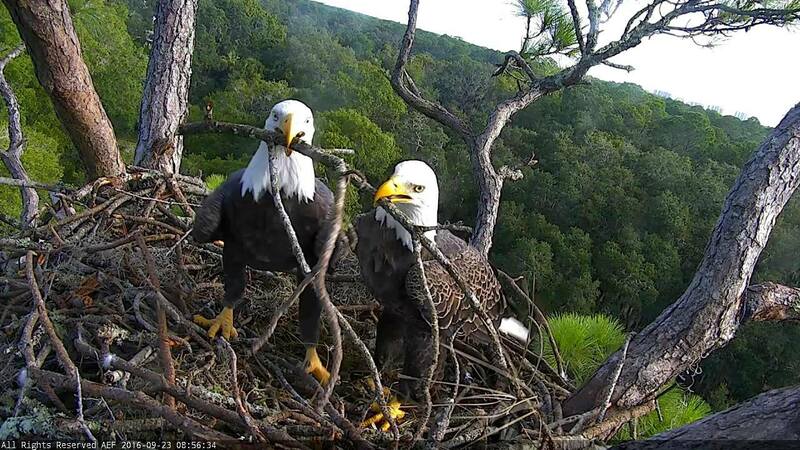 Romeo & Juliet worked diligently on their nest, with a few (maybe more than a few) disagreements on stick placements! So the nest was prepped and the clock seemed to tick ever so slowly. 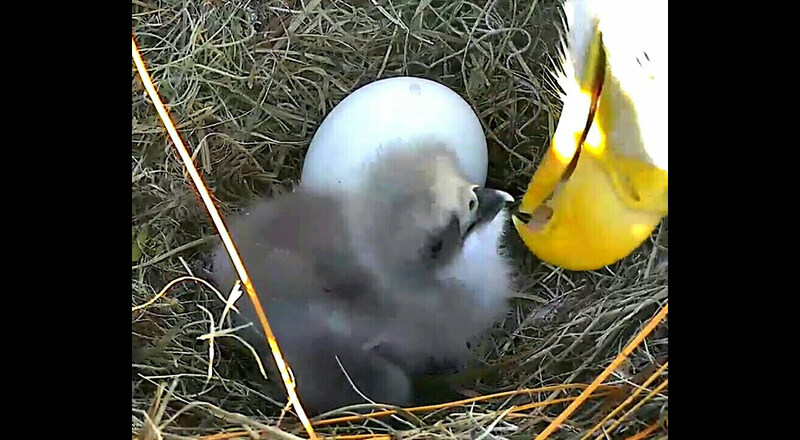 Lo and behold the 1st egg appeared on 11/2/2017 and the 2nd egg was laid not too long after on 11/5/2017. And then the clock once again was in slo-mo, or so I always think. I have always enjoyed this time though as “visitors” usually come around and check out the nest tree.They never disappoint me. 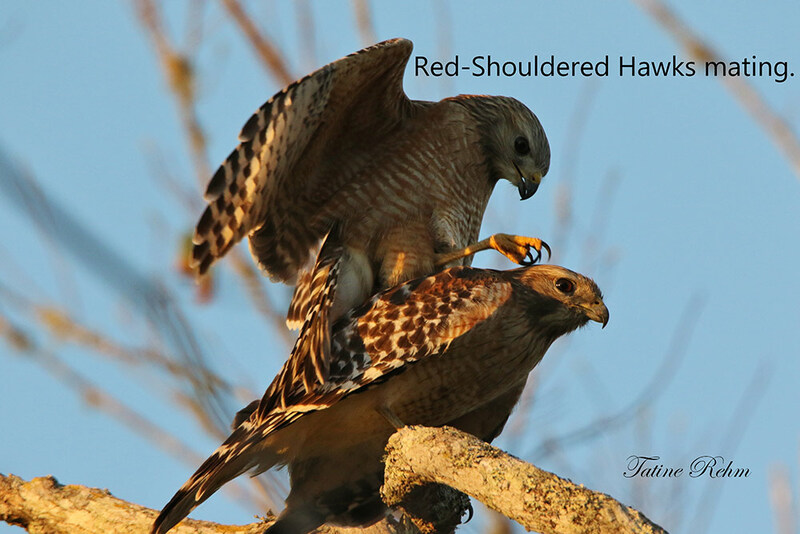 Several sub-adults and a red shouldered hawk stopped by early before the eggs were laid. What fun! And then a few more visitors waited for the eggs to be laid, and flew in for a quick check. A beautiful sub-adult visits on 12/3/2017. First was a beautiful sub-adult on 12/3/2017 – right there on a branch ever so close to the nest with Juliet incubating the eggs. Juliet was making the softest chirps, but no doubt those chirps were not the most welcoming chirps. A wild turkey stopped by for a visit. Check out the wild turkey that flew in on 12/13/2017 and perched on a branch, and yes, while Juliet was incubating as well – this was a first and one for the books! “Not staying Juliet, just getting a better view of the Hamlet.” Another time on 11/9/2017 Juliet showed her fierce and very protective side when an owl came too close to the nest. The wings spread out told the story. 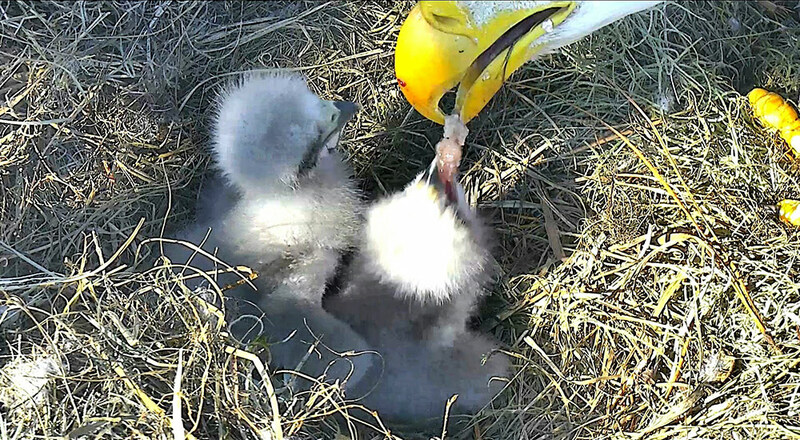 And then the best part of all, before I knew it, the time flew by and the eaglets hatched – NE18 on 12/9/2017 and NE19 on 12/11/2017. As I have always observed from these 2 dedicated eagle parents, the instincts kicked in and Romeo and Juliet brought in food and nurtured the wee ones, predicted the weather changes by bringing in more moss to keep the eaglets warm and as dry as possible, continued to build up the rails for the eaglets’ protection and ultimately raised 2 beautiful and strong eaglets, Sky and Spirit. Sky & Spirit anticipating a food delivery from Dad. It has been an experience for me that I cherish each and every year – that I get to watch and continually learn about the lives of these majestic raptors. I never want the season to end but as the 2017/18 season comes to a close, it is apparent that the Hamlet continues to work its magic. The “balcony” home of Romeo and Juliet once again came alive with 2 magnificent juveniles. I wish continued success for this nest and many thanks to AEF for providing this window into the world of Romeo & Juliet and their eaglets. Stay safe out there Romeo, Juliet, Sky & Spirit. Soar high & free! I have been sitting here, trying to pin-point my favorite part of this 2017-2018 Season. Each year gets better and better, but this year, has been extra special. Starting with Romeo and Juliet coming back at the beginning of the season, getting their “home” ready for the arrival of their next generation. Watching Romeo and Juliet find the exact placement for the railings to keep their soon to be precious bundles safe. To add just the amount of moss to make the nest bowl nice and comfy to keep their, soon-to-be, family feel secure. Then watching the development of Sky and Spirit from tiny grey fluffy puff balls with tiny pink feet grow into the magnificent eagles they have in just 12 short weeks is truly nature at it’s finest. The commitment of Romeo and Juliet to each other and to their offspring is amazing. But the most memorable time was when 16 mods and cam operators arrived at the Hamlet for our First AEF-NEFL Mod Retreat! What a treat it was to finally meet everyone. The prize at the end of the rainbow was seeing the Hamlet in all it’s glory, with Romeo, Juliet, Sky and Spirit. Sky and Spirit gave us show, wingercizing and helicoptering. But to see the “stars” Romeo and Juliet was very special, they truly are two very beautiful eagles. A big “Thank You” to AEF, Al, Gretchen, all the NEFL mods, cam operators and the ground crew. What a joy it is be with this wonderful group of dedicated and caring people. May we always have a season like this one! 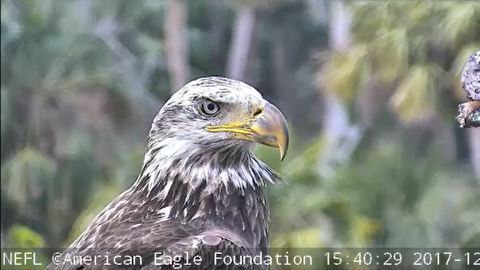 It was December 10th, 2017, at 12:59 A.M., and I was on pip watch for the first time, my first season as a volunteer cam op for AEF-NEFL’s wild eagle nest. I sat at my pc, anxiously watching Juliet as she sat incubating her remaining egg. The other egg had hatched the day before, so Juliet was already keeping one tiny eaglet cozy & protected beneath her warm brood patch. I waited for her to raise up and roll the egg, check on the chick, and re-position herself on the nest bowl, which she did several times per hour. But at this moment, as she raised off of the nest, in the IR light coming from above , I thought I saw something. I looked really hard as Juliet started to settle back onto the nest bowl again, and yes! Sure enough, I was sure I could see that tiny crack and protrusion of the shell that meant our second little eaglet was trying to push its way into the world. 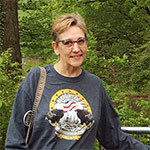 My heart was racing, and as Juliet settled back down and wiggled into a comfortable position, I began frantically texting and contacting Gretchen and our team, letting them know what I had observed seconds before. The texts went wild, all of our team communicating and rewinding the cameras to minutes before, and they saw what I had seen..our precious second egg had a confirmed pip! The news was passed on to all of our viewers, who were also awaiting the great announcement, meaning both of Romeo & Juliet’s eggs would hatch again this year. 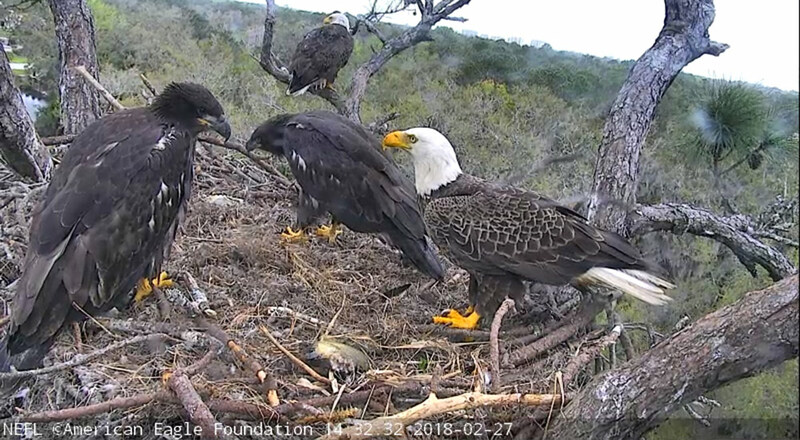 I was so excited to have had the honor of being one of the first ones to see the beginning of what would become a beautiful and peaceful season at our NEFL eagle nest. 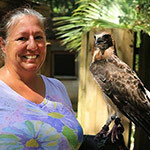 And this pip that I saw that night for the first time, has become a gorgeous juvenile Bald Eagle fledgling named Spirit. Along with his older sibling, Sky, they have captured the hearts and very souls of each of us who have watched them, from Juliet laying her eggs, she and Romeo so tenderly brooding them, to pips, to hatches, to today, when we watch daily as these two beautiful young eagles soar to and from their nest, flying free, and loving the life their parents gave them. What a joyful part of our lives this eagle family has come to be. 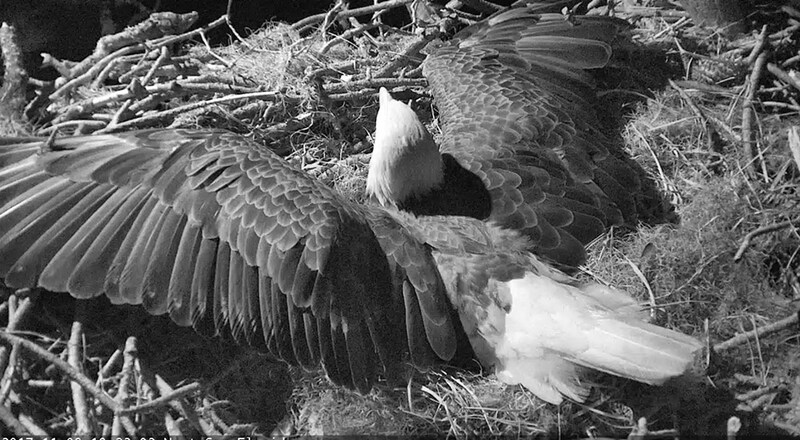 God bless this precious family, and thanks to the American Eagle Foundation, we will get to experience many more wonderful years of observing this nest in the Hamlet. A slideshow follows – be sure to click to advance the pictures if they do not do so automatically. 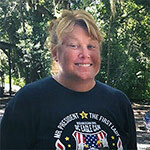 Imagine my surprise and delight when our Gretchen reached out to me to become a chat moderator for NEFL! I hemmed, I hawed, I was excited! What an honor! I gladly applied and was brought on board. Hmmm, we need another new mod! Grammie, we want you! Grammie thought about it, and thought about it, and also came on board! We had the help of all of the current mods and cam ops, giving us tips and tricks, and as October 7th drew closer, our nerves grew to new heights! We rose early on that fateful Saturday morn, and PMd each other on Facebook. “We got this!” “I’m so nervous!” A confession from Grammie to me, she was off to shower and get dressed before chat. Oh my, I thought, as I poured myself another cuppa joe in my Romeo and Juliet mug, what am I doing in my PJs still? I stayed in my jammies for that chat, and every one since. This season I was able to watch our Juliet lay her eggs for the first time. I had never been lucky enough to watch that. Such an amazing mother! And knowing that those two eggs would hatch to become our wonderful Sky and Spirit. 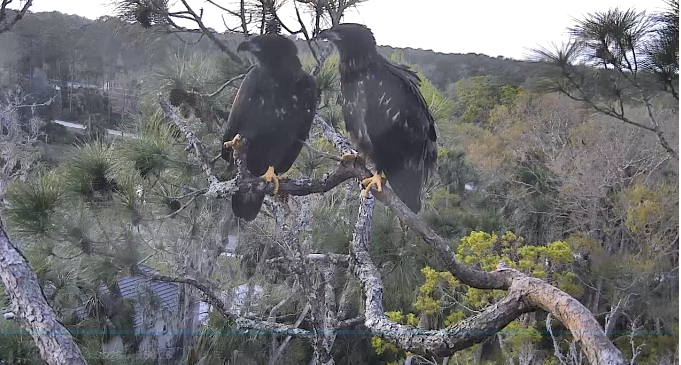 It’s always a special moment to watch the eaglets fledge. It is a most joyful moment for me. I will never forget the ease and confidence that Spirit had when he fledged. Or the sneaky way Sky fledged! So high on a branch, the cam could only see talons, pantaloons and a snip of tail feathers. Then off Sky went! 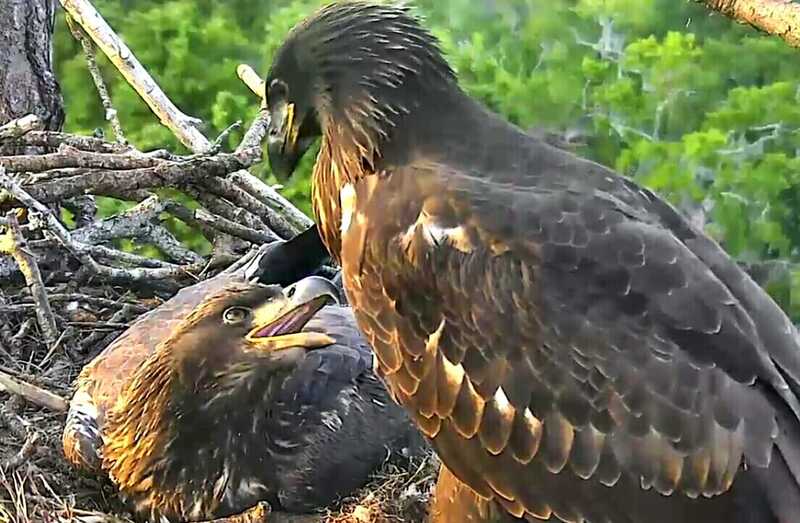 They will be on their journey soon and I could not be happier that Romeo and Juliet raised two more strong, confident and noisy eaglets! 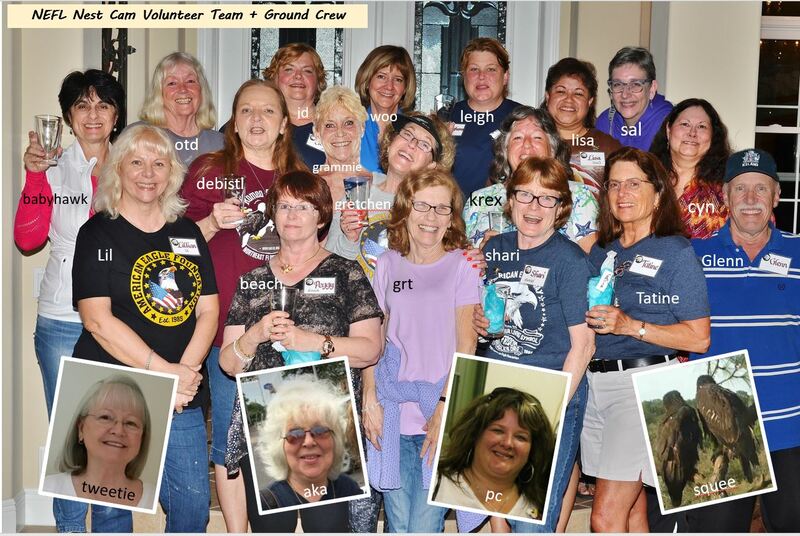 Grammie and I are so proud and grateful to be a part of this wonderful team, and look forward to years to come with our wonderful chatters and fellow volunteers. P.S. No pics of us in our jammies! How does one write a blog about just one pair of fledglings? Or elaborate on what other NEFL-ians have already said? Our seasons always start, as we wait with bated breath, for Romeo and Juliet’s safe return from their “vacation.” And when they do, oh how we all rejoice and can breathe a sigh of relief! Let the nestorations, mating, egg laying, pips, hatching begin! It’s hard to write about this season only, without remembering, with tremendous love, the previous years and fledglings. I wish I could have known Romeo & Juliet’s parents because these two have exceptional genes! So, with a gene pool like that, Sky & Spirit have the best start to life! 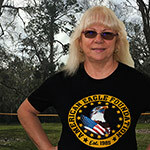 This season I was presented with the wonderful opportunity to join the AEF-NEFL team as a remote camera operator. This experience has allowed me to become more educated in the lives and habits of these amazing eagles. Cam operations have provided me with the unique ability to view our nation’s symbol of freedom, in its natural habitat, on a minute to minute basis. 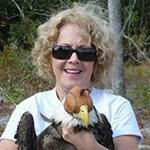 This allows us to spread our collective love and knowledge of eagles to our curious viewers. I loved watching Romeo and Juliet work as a team building the nest, incubating, and raising Sky and Spirit. 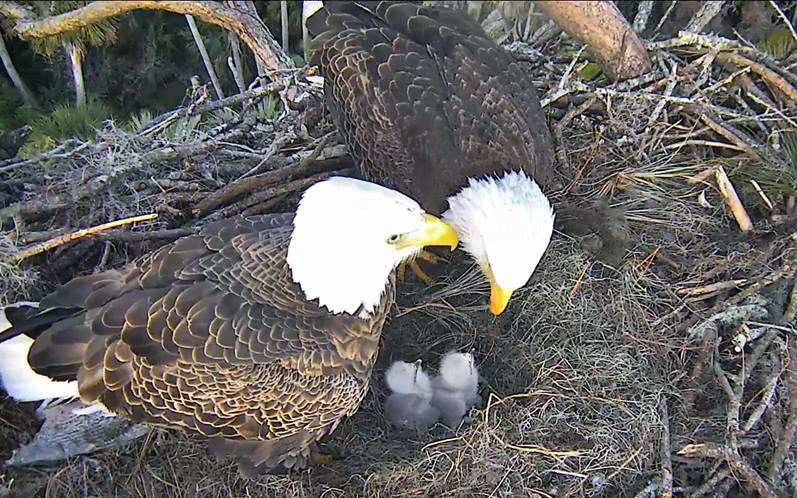 The love Romeo and Juliet share and pass on to their eaglets is heartwarming. I have had the great fortune to be invited to attend this year’s cam operators and moderators retreat in Florida. There I met the people behind the keyboards and cameras. You would be hard-pressed to find a more dedicated and caring group of “Eagleholics”! Thank you, AEF, Al Cecere and Gretchen Butler for putting together this wonderful team and allowing me to be part of it. It has been a truly humbling experience to be part of the NEFL team. 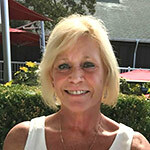 Below is my heartfelt feelings about the NEFL nest, Gretchen Butler working in conjunction with Al Cecere and AEF to not only see the vision of cams in this nest, but to bring it to fruition. I am not sure there are enough words to describe the dedication of everyone involved in this project, from digging ditches, to running cable, to finding an arborist, and on and on. Then to have the host of volunteers who graciously give their time for this cause, all to further educate about the Bald Eagle and ensure their future. 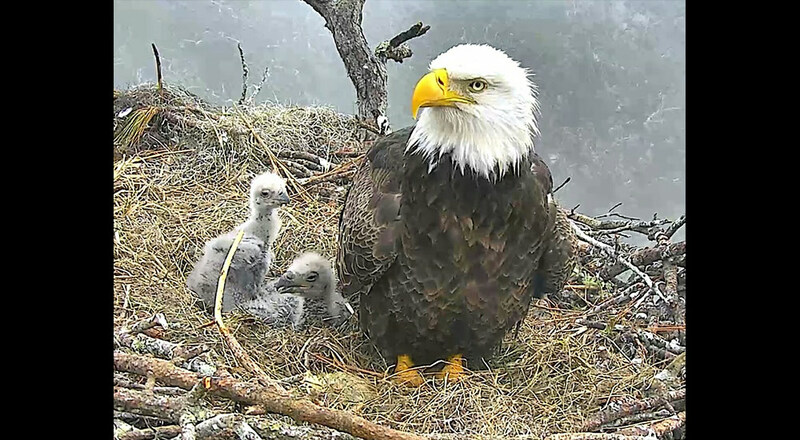 We have learned so much from watching cams in the wild, gaining a spectacular view into the day-to-day life of a Bald Eagle and their nesting habits, raising their young, and the fierceness they can display when protecting their nest. 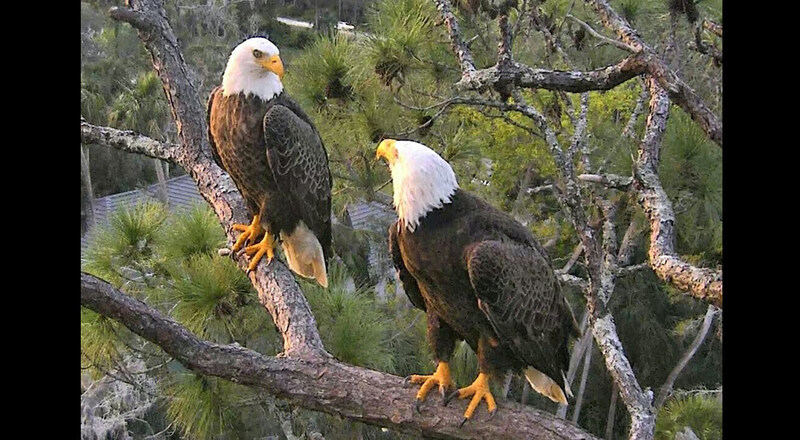 I first found out about the NEFL cams through a local real estate newsletter. Their lead story was about cams going live in a Bald Eagle nest (no location given). I clicked on the link, and there were Romeo & Juliet and 2 week old Samson and Delilah. I could not stop watching. 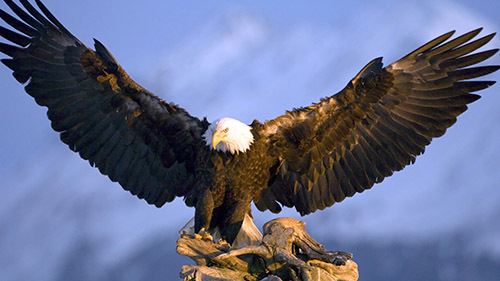 I was so impressed with what I was reading in the chat window about these magnificent birds, then to follow the links the mods posted about “The American Eagle Foundation.” I could not wait for season two to come. I kept going to the web page and waited for that little flag that says, “See you in the Fall” to be gone and the announcement that Romeo & Juliet have returned! I became a moderator for the season of Liberty & Justice. Since I began watching this nest, each and every year has been different in one way or another, bringing new insights, joy, and discovery. Now to our magnificent season with Sky & Spirit. Reassuring the chatters that Spirit would catch up in size, and today, hardly being able to tell them apart. I enjoy just watching them think, like they are plotting their next move, fledging so beautifully. 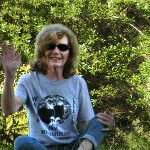 Some of my memorable moments would be when Spirit came crashing in on Juliet after being chased by crows! What a lesson for Spirit! And when Sky landed on top of Juliet in the nest. I studied that video and I personally think Sky was going for the food that Juliet had. I think Sky was just as surprised as Juliet!! I guess I am just amazed at the parenting skills of Romeo & Juliet. 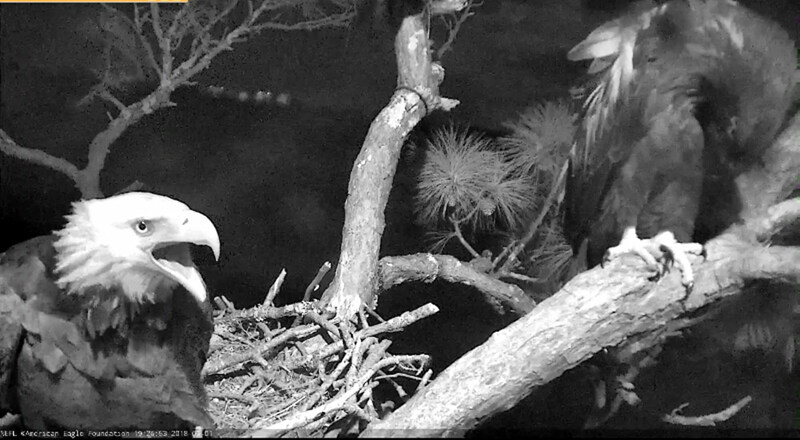 Everything that happens in this nest is a lesson, truly a lesson in humanity taught by two Bald Eagles in a Long Leaf Pine tree in a magical place called the Hamlet. 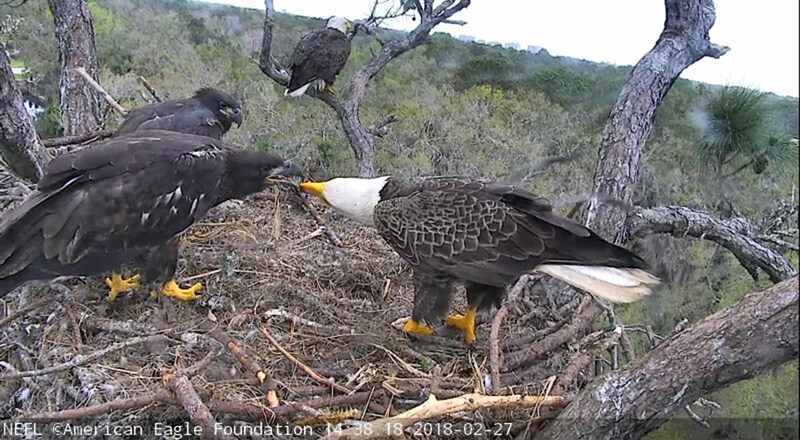 All my fellow moderators and cam ops have one thing in common, the love for this nest, AEF and the camaraderie that has grown between us all, because of these two Bald Eagles named Romeo & Juliet. The beginning of life is magical to me. During the incubation period I would picture our baby eaglets growing, but not until that first PIP happened did it become really real to me. Seeing that tiny egg tooth hammering and hammering away for hours on end mesmerized me. Those little chicks were now breathing and then the egg split open and a damp little life was in the nest. 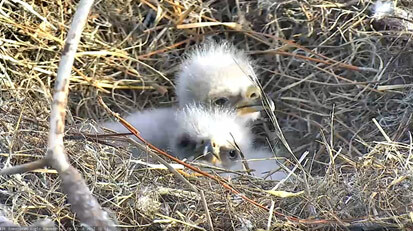 Within hours our baby eaglets were fluffy and ready “to take on their new world”. Romeo and Juliet kept the pantry filled and our eaglets grew and grew and grew. 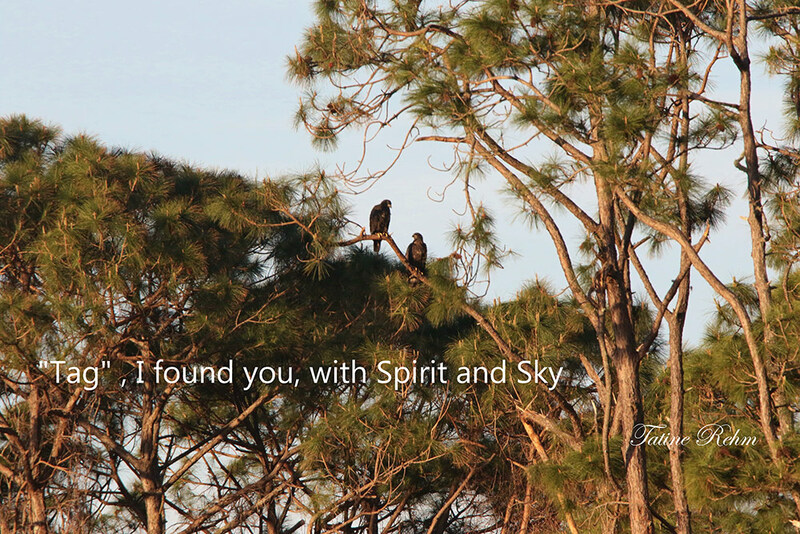 13 weeks later Sky and Spirit, now as large as their parents, continue with their flawless flights and landings …… and the MAGIC continues! In trying to reflect on my “favorite” part of the season, I am finding it very difficult because this season has been almost like a fairy tale – textbook perfect! Every moment has been precious and whimsical, funny and poignant! The second incident—at the end of February during a full moon—lasted for several hours. Juliet put on a display that I don’t think any of us has ever witnessed before. The flapping of her wings and the stomping of her feet at the side of the nest to ward off an unseen, unknown threat still sends goose bumps down my back as I recall it. Again, happening during chat, it was a scary moment for all concerned, but in the long run, it reassured everyone that Juliet is a force to be reckoned with. Her babies come first, whether still in eggs or ready to face the world, she is one fierce momma! A slideshow of Juliet’s “fierce protectiveness” follows – be sure to click to advance the pictures if they do not do so automatically. I love this nest; I love these eagles and all that they have taught me about life, love, sacrifice and commitment! A favorite time of the eagle season…that’s an easy one for me: fledge time. I am a ground photographer for this area, and I love to capture the young eagles in flight and see them learn to land with grace. It’s a fun challenge to follow the eagles around the Hamlet playing “hide and seek” as they fly from tree to tree. 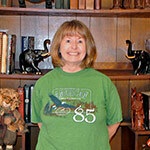 I first discovered the nest in 2010 and soon met Gretchen and Glenn. 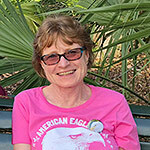 We have enjoyed many hours together at the nest, as well as taking a few field trips together. I have also met many wonderful people through this eagle nest of Romeo and Juliet. Another wonderful aspect of this nest is the area in which it is located. There is a number of “friends” around the nest consisting of deer, various birds and a few pond dwellers, some more friendly than others but all are fun to watch. A slideshow follows, featuring some of Tatine’s “friends” from the Hamlet – be sure to click to advance the pictures if they do not do so automatically. Where do I even start trying to pick a favorite part of this season? The Hamlet is a magical place that just has a special aura about it. My season started on an extremely hot Florida Summer weekend when I went to the Hamlet to help AEF with the annual cam maintenance. We were digging a trench 18” x 24” for over 200 plus yards from the nest tree to the equipment box. I’d take a couple digs with the shovel and felt like I was going to pass out from the heat. So many people wouldn’t want to do this job, but to me it was a way to give back to AEF for all they do for us. In the next couple weeks Romeo & Juliet returned home to the Hamlet from their well deserved vacation and quickly prepared their beautiful nest. The Mossman would bring in all the moss he could find along with branches. Juliet was right there to tell Romeo she was in charge of decorating. As Fall came we were blessed with 2 eggs from which 2 perfect miracles emerged. Those precious little bandit faces who stole our hearts at first glance grew quickly and became best friends…..our beautiful and graceful Sky and our funny and spirited Spirit. We watch the cams each day and wonder if it will be the last time we see our sweet Sky and Spirit before they leave on their big adventure called “life”. Each moment we have is a gift. When the day comes that Romeo and Juliet bring a headless fish or a coveted squirrel to an empty nest, not followed by ear piercing squees of joy, tears will be shed as this day is always bittersweet, we must remember that the season begins and also ends with our Love Birds, Romeo & Juliet. 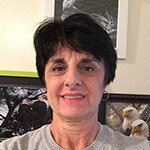 Thank you to AEF, Al Cecere and our dearest Gretchen for giving us the gift of our beloved NEFL Eagle Family, NEFL Nest Volunteers and Chatters. 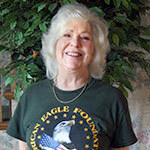 Each session of Chat is like a family reunion with sweet friends who all share a love and passion of Eagles. Wow! Hard to know where to start. With exceptional parents Romeo & Juliet, and 5 seasons since cameras were installed, there have been 10 eaglets with 10 different personalities that we have witnessed grow up. 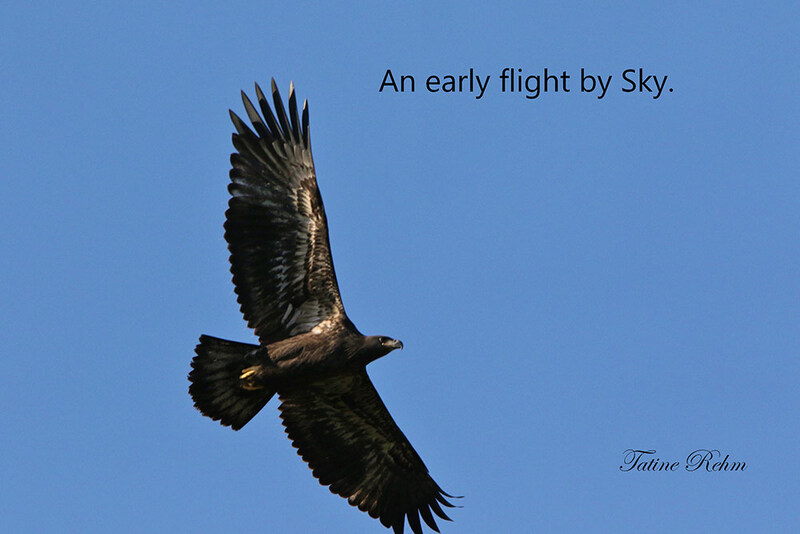 Each season it seems that the eaglets are more advanced than the year before. 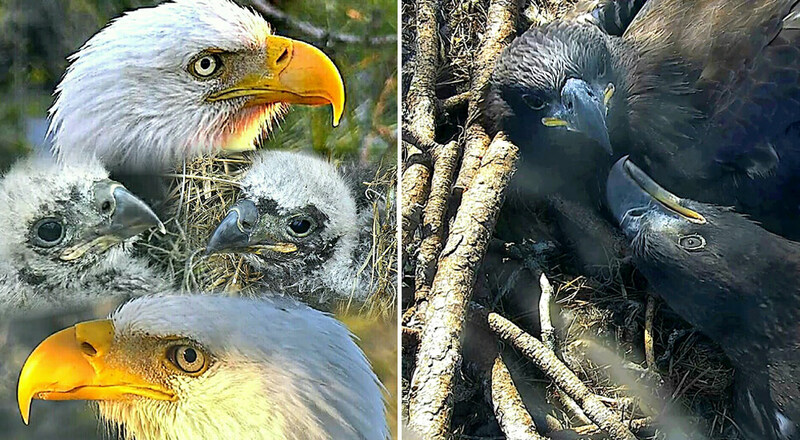 The latest set of eaglets, Sky and Spirit, are no exception. While Sky imitates Juliet by being a “mombrella” to Spirit, Spirit likes to play with moss and sticks like Romeo. From little balls of fluff to beautiful and fierce “Lions of the Skies,” both have perfected their take offs and landings that would make make even the most skilled pilot jealous. The one thing, though, that never changes is the clearly-evident love that Romeo & Juliet show for each other and the eaglets, as well as the love the eaglets have shown for each other. 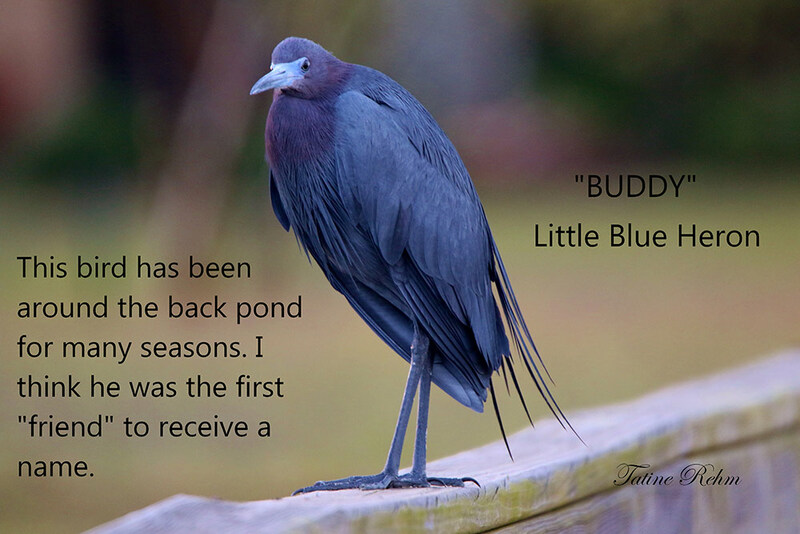 Some may argue that it is merely us applying a human emotion to a bird. But the many different displays of affection refutes that.Such a wonder to behold from one of God’s most majestic creations. Do you all remember when we were in grade school and after coming back to class in September, we were tasked with writing a short paper about our favorite moments from summer vacation? That’s kind of how I feel now writing about my most favorite memories of this NEFL season: the cam experience, the Hamlet, Romeo and Juliet, Sky and Spirit and all of my NEFL teammates and how much all of it means to me. 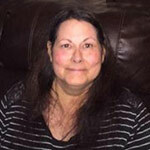 Five months ago, I was a chatter at NEFL. I didn’t think it could ever get any better than that. Waiting for each chat session to begin I was like a kid at Christmas. But then, just 5 months ago, Gretchen asked me to be a mod! That one phone call changed my life. It gave me purpose and a chance to give back. I love being part of such a caring, loving group of educators and friends. This group is woven together through mutual respect and love. Gretchen is our example! The Hamlet has always been a special place for me. This season has surpassed anything I have experienced here in the past and anything I had hoped for this year! The bond between Romeo and Juliet and their offspring is beyond words. They are the epitome of love, devotion, hard work, caring, nurturing and majesty. From pip watch, to hatch, to branch, to fledge, every moment has been so precious and so very special. I look forward to many more seasons with my Hamlet family. There are so many special memories each and every season, especially witnessing the love and parenting of Romeo and Juliet and their unfailing protectiveness around their babies. However, this season became very special for me when I was on cams for many, many hours during the hatches of Sky and Spirit. Zooming in for those first looks at their little faces and watching them squirming and falling over backwards and discovering each other in the nest for the first time… those are priceless memories I will never forget. Following them as they became buddies and fledged and returned to their nest after becoming so close to them on cams has just provided “add-ons” to my joy throughout this season. My appreciation for AEF and all involved in this project just continues to grow with time. Spirit (left) and Sky – one of the last photos of these two together. As the wise Dr. Seuss said, “Don’t cry because it’s over. 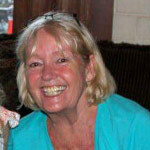 Smile because it happened.” Godspeed, Sky and Spirit.